Mapping out the Gregg Popovich/Steve Kerr White House. Woke Forest: What if the NBA Ran the Executive Branch? 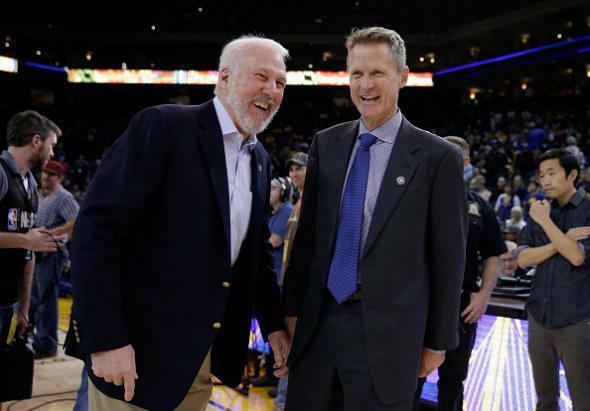 San Antonio Spurs coach Gregg Popovich and Golden State Warriors coach Steve Kerr in Oakland, California, on Nov. 11. It always intrigues me when people come out with, “I’m tired of talking about that” or “Do we have to talk about race again?” And the answer is you’re damned right we do. Because it’s always there, and it’s systemic in the sense that when you talk about opportunity it’s not about “Well, if you lace up your shoes and you work hard, then you can have the American dream.” That’s a bunch of hogwash. If you were born white, you automatically have a monstrous advantage educationally, economically, culturally in this society and all the systemic roadblocks that exist, whether it’s in a judicial sense, a neighborhood sense with laws, zoning, education, we have huge problems in that regard that are very complicated, but take leadership, time, and real concern to try to solve. To be frank, it’s getting irritating, this five-time NBA champion head coach who’s better at concisely and persuasively summarizing political issues off the cuff than I am at doing the same despite having the luxury of word processing software and it being my only job. But anyway: While the notion of a Popovich 2020 campaign has been floated in jest (although not entirely in jest) for a few months now, at this point enough NBA figures have criticized Trump that we can go beyond the top of the ticket. Let’s play it out all the way, in classic internet What if People From One Thing Were Put Into Another Thing fashion, by assembling a woke basketball Cabinet. President: Gregg Popovich. I would genuinely enjoy trying to see the right-wing smear media try to come up with an angle on Popovich, an Indiana-born immigrants’ son and Air Force veteran who is one of the most successful figures ever in one of the most purely meritocratic fields around. Vice President: Steve Kerr. Mentee of the top guy who’s only a few years into a promising career. Eyeing 2028. Chief of Staff: Doc Rivers. An inspiring motivator and clever tactician. Might get tangled in nepotism laws. Attorney General: Adam Silver. NBA Commissioner Silver’s post-election statements have been circumspect, but one can read betweet the lines. A University of Chicago–trained lawyer, Silver demonstrated his fitness for the AG job by orchestrating the deft but muscular legal/political process by which infamously racist Clippers owner Donald Sterling was pushed into selling his team. Secretary of Defense: LeBron James. Will track our enemies down. Secretary of the Treasury: Bill Bradley. The original hoops liberal has to be on this list. Treasury? Sure, why not. Secretary of Labor: Chris Paul. He’s already the president of the NBA Players Union. Head of Transition Team: Magic Johnson. Transition, right? Like how a fast break is transition offense? LOL. Madonna: J.R. Smith. Gotta have her/him at the big march on Washington/victory parade. Known for shirtlessness. Bill Clinton: Phil Jackson. Widely respected for what they did in the ‘90s; hearts are probably in the right place; still put their feet in their mouth on the regular. And hey, what about Rajon Rondo for the Department of Housing and Urban Development … because of bricks! Get it? OK, we’re done here.